Are Women The New Sneakerheads? 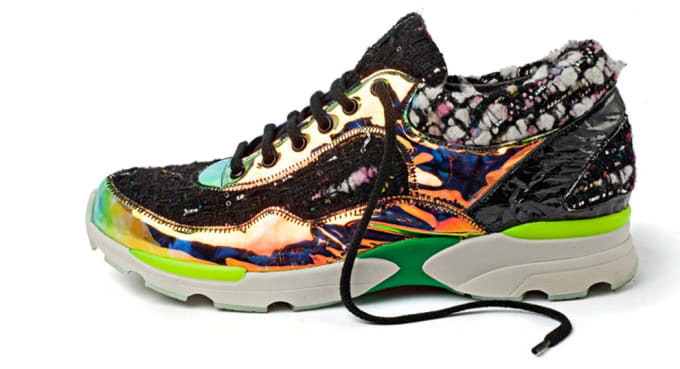 Sneakers in fashion and fashionable sneakers currently have a stranglehold on the style community. We at The Pinz rave about high-end sneakers and new Nikes on a daily basis, an infatuation that&apos;s lead to some more senior members of the sneakerhead community to lash out. It&apos;s true that what was once a cornerstone of streetwear has risen through the ranks (and tax brackets), and not only entered the world of high-end menswear, but now womenswear as well. Our very own Rachel Seville recently penned an article for Bullett exploring this phenomenon and, on an even more incestuous note, spoke to our very own EIC to get his take on this apparent trend. Rachel points to Chanel&apos;s recent supermarket extravaganza fashion show as the critical women&apos;s casual footwear moment of the season. The models in Chanel&apos;s RTW F/W 14 show didn&apos;t don pumps or flats as they pretended to buy Chanel branded bread and flour, but, instead, colorful running sneakers that, for one, were far more realistic in terms of what women actually wear to go grocery shopping, and yet still managed to evoke the French label&apos;s signature elegance and style. No one is doubting that sneakers are having a moment for women, but ultimately, the jury is still out on whether or not this means we can expect women lining up for new Nikes the way countless men have made a lifelong hobby doing. Most importantly, only time will tell whether the high-end sneakers styles born out of streetwear and high-fashion&apos;s current tryst will continue to grow in popularity, or if they&apos;re merely another quick-burning fuse in the hyper-paced world of womenswear.